Since taking part in the very first intercollegiate football game in South Carolina in December 1889, Wofford’s team has had many memorable moments. The era of the late 1940s and early 1950s, under legendary head coach Phil Dickens, has a good number of those highlights. Coming off an 11-0 regular season in 1949, ending with a New Year’s Day loss in the Cigar Bowl in Tampa to Florida State, the 1950 Terriers were hopeful of another good season. Members of the Eleven Club – the precursor to the Terrier Club – were perhaps a little less than enthusiastic when the 1950 schedule appeared. The first game on the schedule was against Auburn, a perennial power. And so on September 22, the Terriers traveled to Montgomery, Alabama for the game against the Tigers, putting their 15-game regular season win streak on the line. The game turned out a bit differently than anyone expected. Auburn jumped out to an early lead, scoring the first touchdown. But then Wofford scored twice, taking the lead at 13-7. Auburn scored again, taking a 14-13 lead, but Wofford got the final score and escaped Montgomery with a 19-14 victory. They were aided by three Auburn fumbles, and a good passing attack. The Bohemian noted that three Bobs were essential to Wofford’s victory. 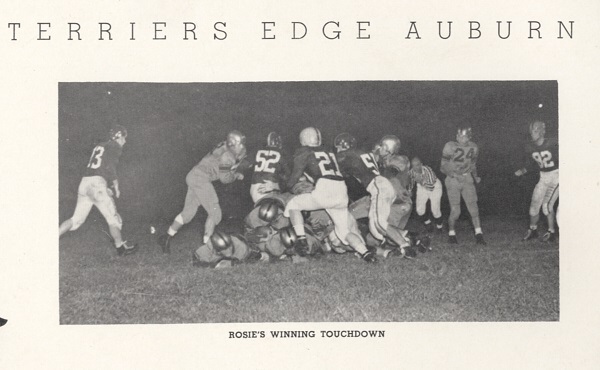 Fullback Bob McLellan was playing in his first varsity game, and he scored one of the touchdowns. 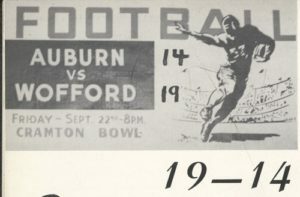 Tailback Bob Starnes moved the ball well, and Bob Pollard covered three fumbles by Auburn that were crucial to Wofford scoring. Auburn went on to a dismal season, losing all ten games. Not surprisingly, their coach, Earl Brown, in his third season, was shown the door at the end of the season. Wofford lost to Stetson the next week, which was its first regular season loss since 1947, but went on to a 7-2-1 season.